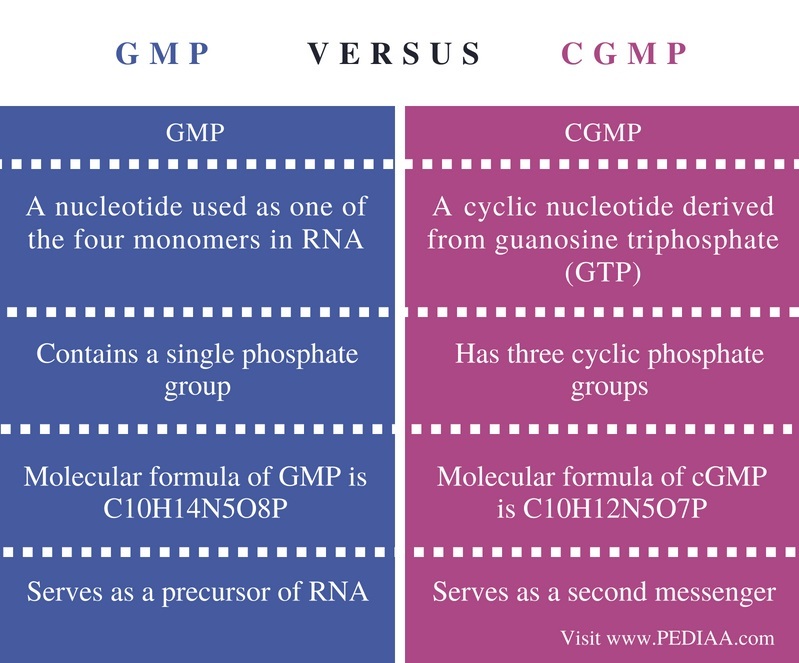 The main difference between GMP and cGMP is that the GMP serves as a precursor of guanosine triphosphate, one of the four monomers of RNA whereas cGMP serves as a second messenger. Furthermore, GMP contains a single phosphate group while cGMP is a cyclic nucleotide derived from guanosine triphosphate. Therefore, cGMP is a nucleic acid derivative. GMP and cGMP are two types of nucleotides that play an important role in the body. Both are made up of a guanine nucleobase attached to a ribose sugar with phosphate groups. 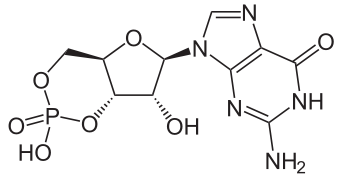 GMP (guanosine monophosphate) is one of the four monomers of RNA. It is also called 5′-Guanylic acid (5′-GMP). It is made up of a guanine nucleobase attached to a ribose sugar with a single phosphate group. Hence, GMP is a purine ribonucleoside monophosphate. D-ribose 5′-phosphate is the precursor of GMP in the pentose phosphate pathway. GMP has a role in some other metabolic pathways in humans such as kanamycin action pathway. Also, it may lead to several metabolic disorders including AICA-ribosiduria pathway, adenine phosphoribosyltransferase deficiency (aprt), adenosine deaminase deficiency, etc. 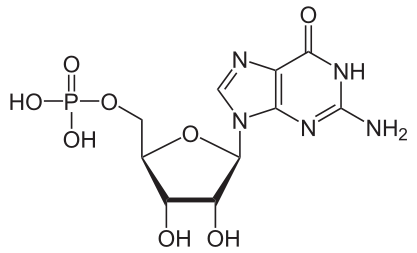 Deoxyguanosine monophosphate (dGMP) is the monomer of DNA, which resembles GMP in RNA. cGMP (Cyclic GMP) is a derivative of guanosine nucleotides with a vital role inside the cell. Production of cGMP is one of the main methods through which nitric oxide is mediated. Nitric oxide (NO) serves as a main neurotransmitter in the brain. The main function of cGMP is to serve as a second messenger, which activates protein kinase G (PKG). The activated PKG is responsible for the effects of NO such as blood vessel relaxation. Activated PKG also activates myosin phosphatase, which in turn, is responsible for the release of calcium from intracellular stores in smooth muscle cells. This relaxes smooth muscle cells. cGMP can convert back into GTP (guanosine triphosphate) by the action of phosphodiesterases. This can effectively block the cell signaling by NO. cGMP also responds to a variety of signals from other neurotransmitters and hormones such as acetylcholine, insulin, and oxytocin. GMP and cGMP are two types of nucleotides with a guanine attached to a ribose sugar with phosphate groups. Both have important functions in the body. GMP (guanosine monophosphate) refers to a nucleotide used as one of the four monomers in RNA while cGMP (cyclic GMP) refers to a cyclic nucleotide derived from guanosine triphosphate (GTP). GMP contains a single phosphate group while cGMP has three, cyclic phosphate groups. The molecular formula of GMP is C10H14N5O8P while the molecular formula of cGMP is C10H12N5O7P. Furthermore, the GMP serves as a precursor of RNA while the cGMP serves as a second messenger. GMP is a nucleotide with a single phosphate group and it serves as one of the four monomers of RNA. On the other hand, cGMP is a cyclic GMP produced from GTP, which functions as an important second messenger of cell signaling pathway. The main difference between GMP and cGMP is the structure and function.